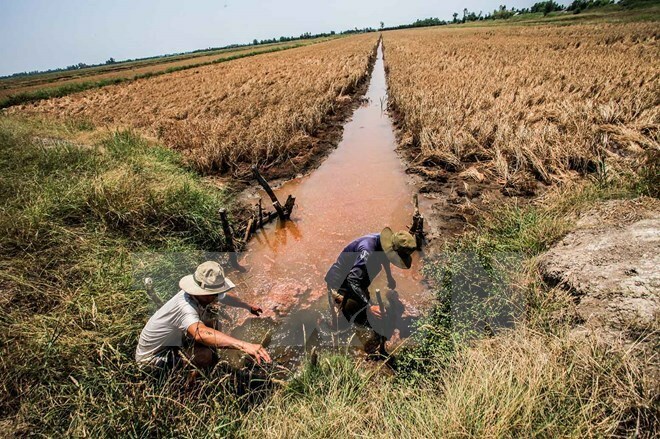 Can Tho (VNA) – Impacts of drought and saltwater intrusion along with countermeasures will be added to the agenda of the Mekong Delta Economic Cooperation (MDEC) forum, slated for this July in Hau Giang province. The inclusion of the drought and saline encroachment problem is because they have become pressing issues facing local residents, Nguyen Phong Quang, Deputy head of the Steering Committee for the Southwestern Region, said at a press conference in Can Tho city on May 11. The forum will take place from July 11 – 15 under the theme “Mekong Delta – Active Integration and Sustainable Development”. It ultimately aims to promote investment, cooperation, science-technology development and international economic integration, he noted. The MDEC forum will feature a workshop on bank credit for the region’s socio-economic development, a business forum, a workshop on hi-tech agriculture, and a seminar on supporting technological innovation. On this occasion, the host province will hold events directly relating to itself such as a conference promoting investment into Hau Giang, ceremonies to start the construction and inaugurate some facilities, and activities to introduce local craft villages and specialties. The Mekong Delta comprises Can Tho city and the 12 provinces of An Giang, Bac Lieu, Ben Tre, Ca Mau, Dong Thap, Hau Giang, Kien Giang, Long An, Soc Trang, Tien Giang, Tra Vinh and Vinh Long. It is located in the southwest of Vietnam.